It looks like not much has changed since those days. 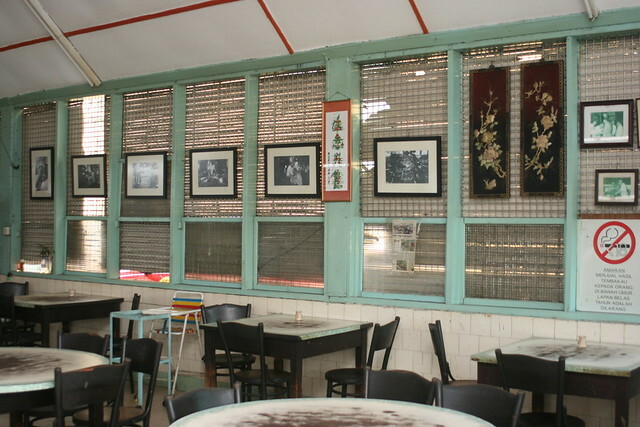 The pre-war building, its decor, furniture, old ceiling fans, wall photos....all so quaint and charming, so full of character. 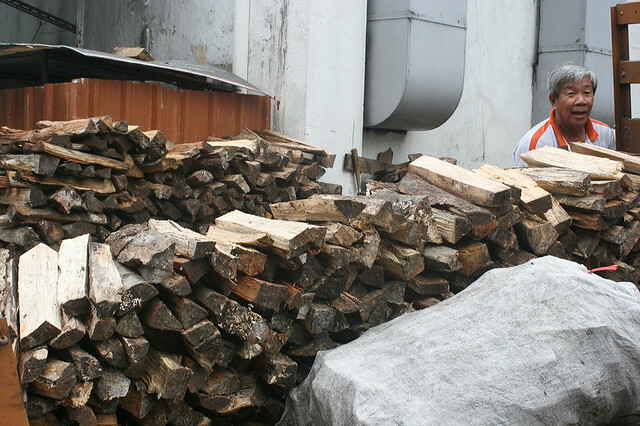 In fact, they still stick to the traditional use of wood for cooking. We entered the restaurant through the back, and it's quite a sight. Here's Jon, looking a bit too hip for his surroundings, but admiring it nonetheless. There are fewer and fewer restaurants like this in the world. 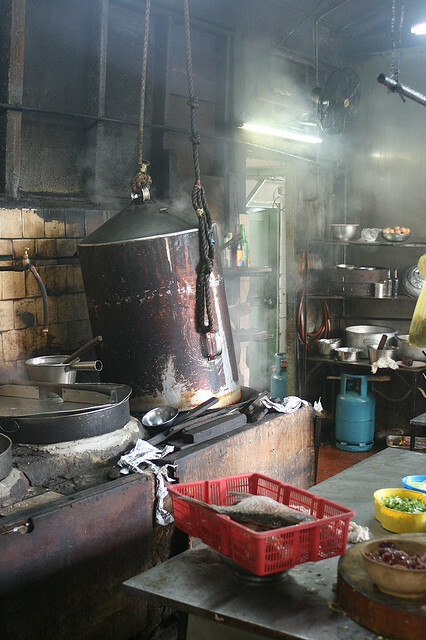 You should take a look inside its kitchen. 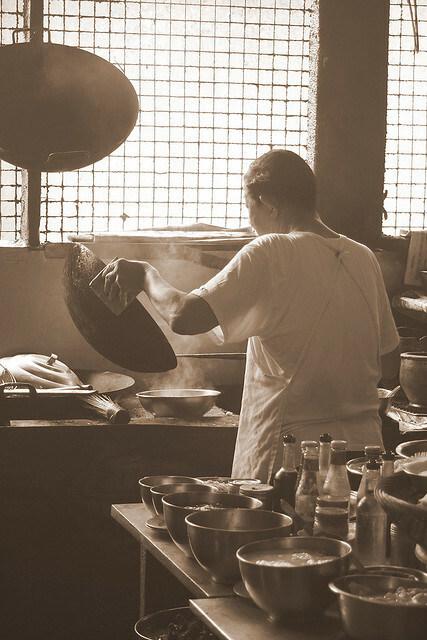 Everyone in the family chips in, whether for preparation, cooking or serving. Oh look, those silver platters with pedestals! They always remind me of restaurants I went to as a child. See the woodfire stove? Burning bright, with woks steaming hot above it. 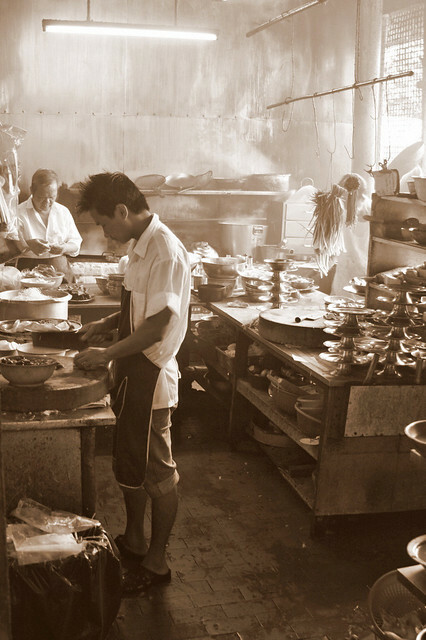 And hey, do the Chinese have a name for mise en place? There's a large drum-like hood attached to ropes and pulleys. This is the steamer cover. I was amazed to learn they don't use rice cookers. 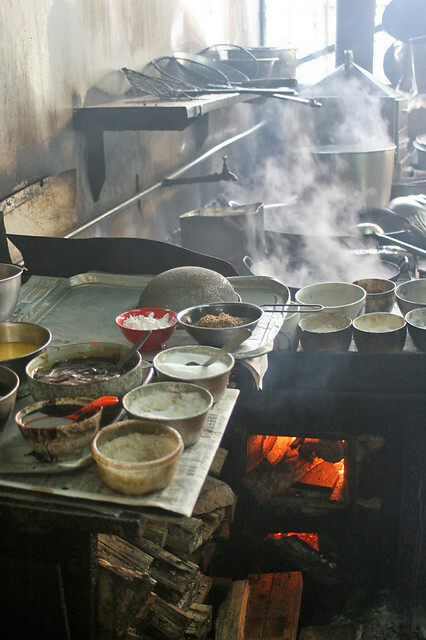 This is what they steam their rice in. 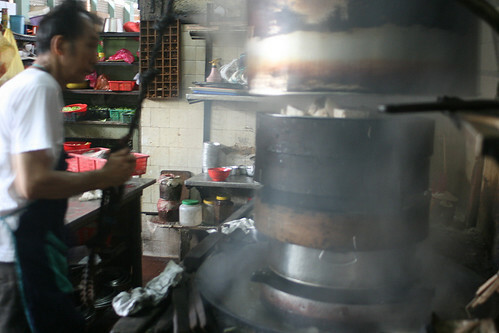 See the old man pulling up the hood, revealing the bamboo trays of food being steamed. I guess it's multi-purpose, you can steam all kinds of things in this! But enough of the kitchen, I am sure we all want to see what the food is like. 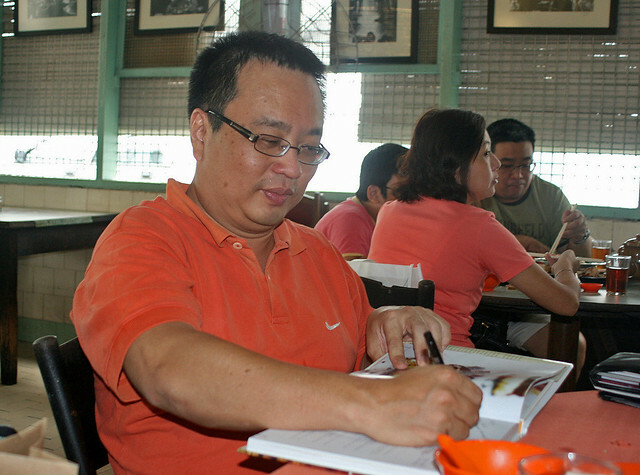 Our blogger friends had already placed orders the day before, so we would be able to try some of the signature dishes. We started off with a platter of what I think might be "gui hua" omelette (I'm bad at names). Absolutely beautiful. Best when wrapped some with crisp lettuce. 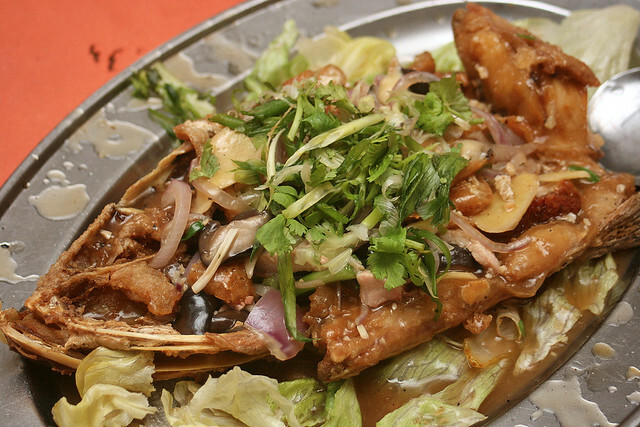 Fried fish head with lots of ginger, scallions, onions and mushrooms. Lots of meat to pick at, and the gravy is delicious. 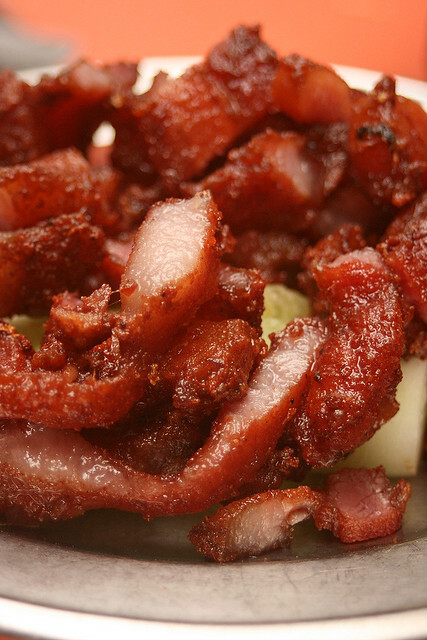 Deep-fried nam yu pork. One of the unanimous favourites at the table. 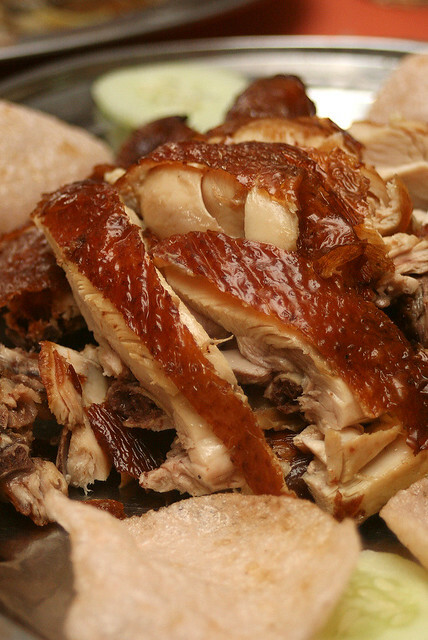 "What's not to like about deep-fried 'char siew'?" someone quipped. 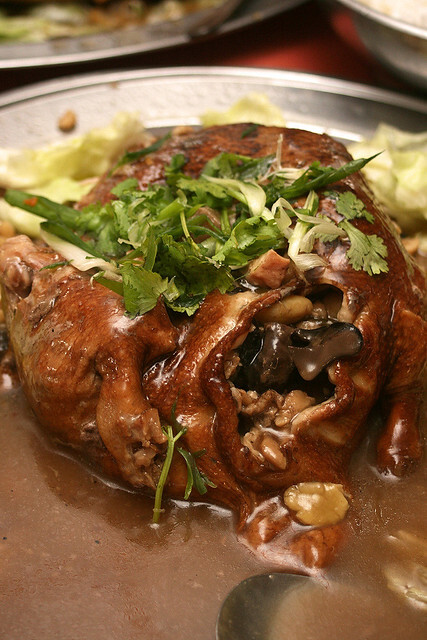 This beauty - Eight Treasure Duck - is a specialty that must be pre-ordered at least a day ahead. They braise it for hours until both the meat and stuffing are so tender and infused with each other's flavours. I stopped counting the ingredients (lotus seeds, walnuts, ginkgo nuts, mushrooms, dried scallops...) and just ate. Mmmh. 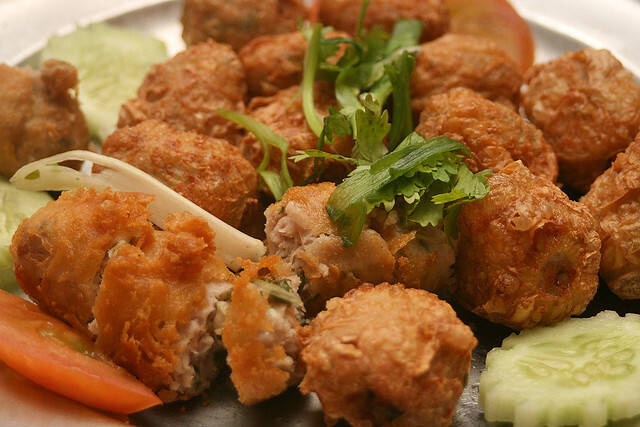 This looks like hae cho (prawn roll) but I think it's more of a minced meat roll. I couldn't make out what else was in it but it tasted quite unusual. 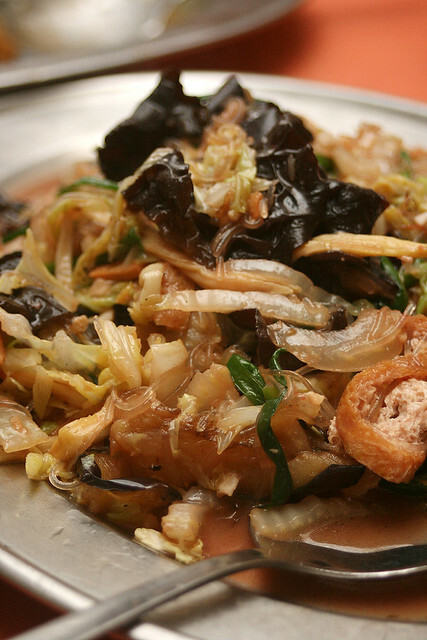 Chap chye or mixed vegetables. Indeed, our token vegetable dish in this carnivorous line-up. Very homely, this. 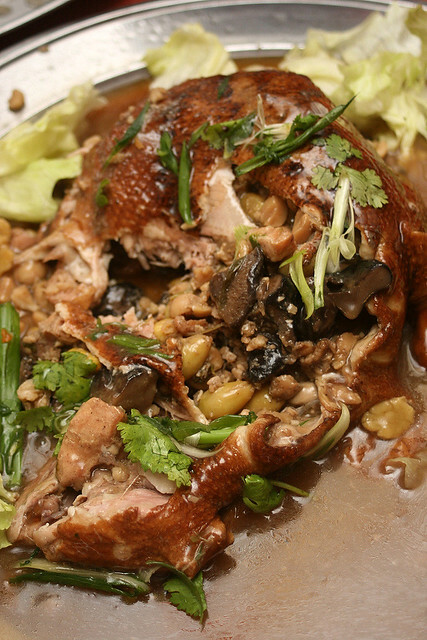 Just when you think it's over, they bring out some roast chicken, complete with prawn crackers! Just right, for Keropokman is here! What a gloriously satisfying meal, made even more enjoyable by lots of laughter and chatter. I even found out that Nigel knows my cousins from my dad's hometown in Sitiawan. Meanwhile, Fatboybakes signed a copy of his book for Keropokman. 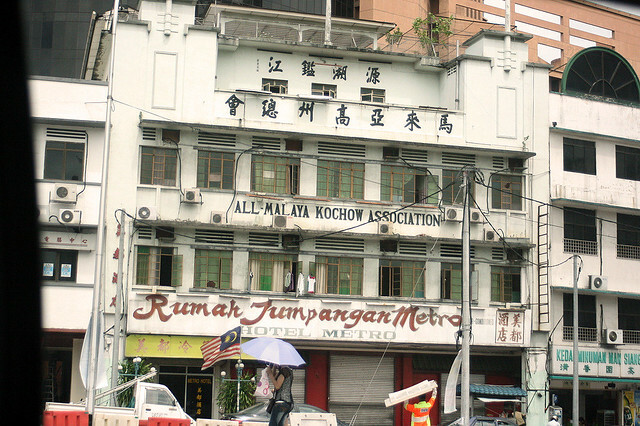 We headed back to the Bukit Bintang area, and along the way saw more old buildings mixed in with the new (KL has lots of these). I love how this one still says Malaya. 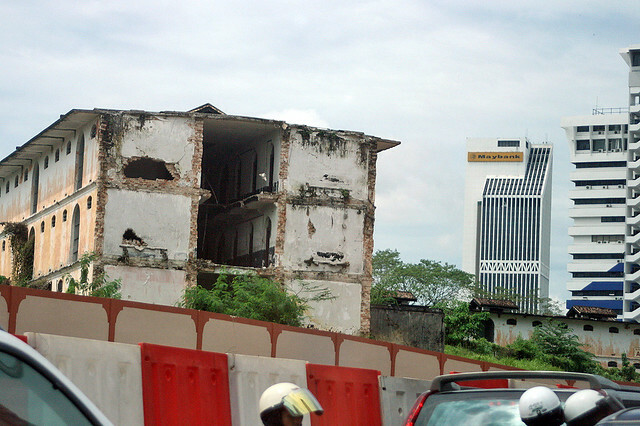 And here's Pudu Jail being torn down. Even though it's more than 100 years old, it's not being preserved as a heritage building. 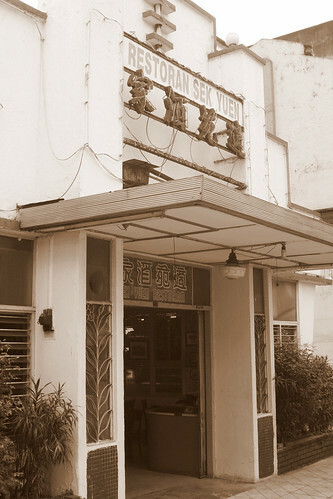 Well I certainly hope places like Sek Yuen will last much longer. It's history that's alive, history you can taste. 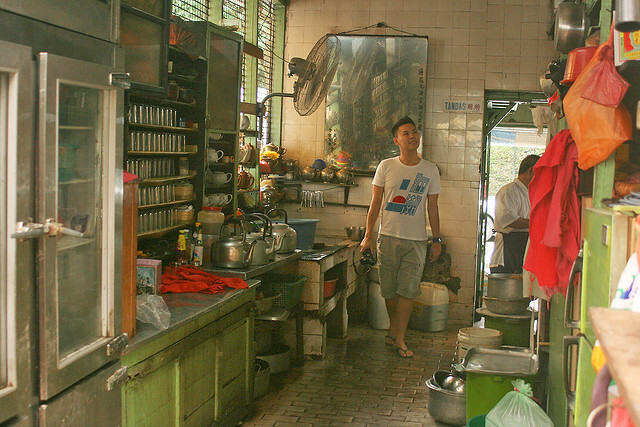 Thank you, our KL friends, for sharing this place with us, and for the fabulous lunch too! And thank you, Royal Caribbean, for the "On Your Own" shore excursion that made this experience possible. It's a great way to catch up with friends in cities you are visiting. Open 11am to 3pm, 5pm to 10pm. Closed Mondays. Wow, your photos are stunning! I esp like pics 6, 7 and 8. Love places like these, so much character. 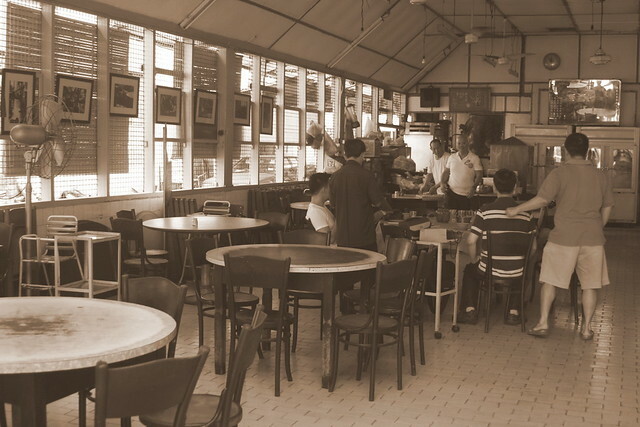 you found this gem.. hehe yeah, one of the old school n superb restaurant in KL. They actually have an air conditioned 'newer' restaurant next door. LOL note I put newer with inverted commas, its still very old! 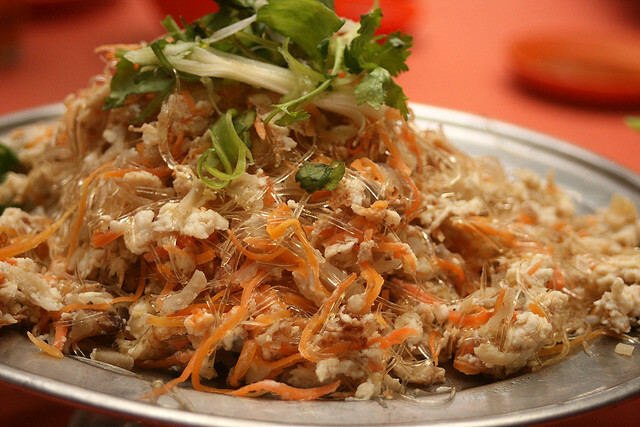 They have lots of interesting food that need pre-order n you need to know what to order too. Definitely a special place. yumms! Thanks, Ju! Yes, I particularly like those too. They should really preserve this place! It's awesome. Hi Joyce! You know this place too? They do have interesting dishes indeed. Yes, it's thanks to my KL blogger friends, cos I would never have found this on my own! I loved your photos. They are so well taken. Reading your blog is so enjoyable, will be coming for more. Glad u had fun in Sek Yuen. It is always special there. One of a kind. Looks like you guys had fun. I hope to meet up with the KL gang when I go back for CNY. Happy New Year. We had so much fun that day! I love going to Sek Yuen. It's a stone's throw away from my office, so we sometimes go there at lunchtime. Hope to see you guys again soon, and thanks for visiting us! Hey, i've been here before (!) when i was still little.. i particularly remember photo 2, 3 & 4!! Bookmarking this, would love to go visit next month! It was our pleasure to show off this place to you guys. It's indeed a living piece of our heritage. Glad you enjoyed it and it was great meeting the both of ya that day. Happy new year and hope to see you guys soon either in KL or in SG! U made me soooooooooooooooooo jealous!!! I oso want to go!! Awesome ! havent been to KL for years, this seems to be the motivating factor !